The oldest written account of the presence of coffee in South America comes from a 1730 manuscript written by a Jesuit priest living in what is now Colombia. Early in the 19th century coffee became a commercial crop for Brazil, Venezuela, and Colombia, and was grown on large plantations by African slaves. Since the abolition of slavery, the vast majority of coffee grown in South America (outside of Brazil) has been grown by smallholders. South America produces 45% of the world’s coffee, and Brazil is by far the world’s largest single coffee producer. Most roasters use Brazilian coffees in their blends, especially in espresso blends. A good quality Brazil can be counted on to have good body and balance and a clean flavor profile, sometimes with nutty and malty notes. Colombia is perhaps the most high-profile coffee in the world. Not all of it is good, but when it is, it is incredibly pleasant: well-balanced, sweet, and bright. Red Rock’s medium Colombia is a high-grade auction coffee with creamy body and brown sugar aromatics. 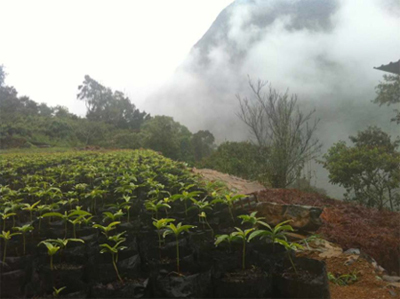 Peru produces a lot of Organic coffee at extremely high altitudes. Peruvian coffees tend to be exceptionally mild and clean. We offer a Swiss Water Process Organic Decaf Peru, which is a fine coffee with subtle acidity and rich flavor.